Mark Zuckerberg, the co-founder and chief executive of Facebook, announced on Tuesday that he and his wife would give 99 percent of their Facebook shares “during our lives” — holdings currently worth more than $45 billion — to charitable purposes. 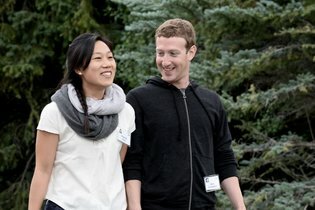 Mr. Zuckerberg and his wife, Dr. Priscilla Chan, said they were forming a new organization, the Chan Zuckerberg Initiative, to manage the money, through an unusual limited liability corporate structure. “Our initial areas of focus will be personalized learning, curing disease, connecting people and building strong communities,” they wrote. Mr. Zuckerberg’s charitable plans are the latest indication of a growing interest in philanthropy among Silicon Valley’s young billionaires, who unlike previous generations of business tycoons, appear eager to spread their wealth while they are still young. Mr. Zuckerberg is 31, and Dr. Chan is 30.